On Saturday, April 26 and Saturday, May 3, the Land Trust held two planting parties at Bull Pond and Forever Forest with the intent to make both areas more attractive for visitors. We hope the plantings will allow full recovery of the cleared area that had been devastated by the 2009 windstorm. The edge of the pond was planted with 18 high bush blueberry plants and 20 small mountain laurels to help stabilize the eroding shore. Two flowering crab apple trees were planted next to the wildlife observation deck to provide shade and beauty. 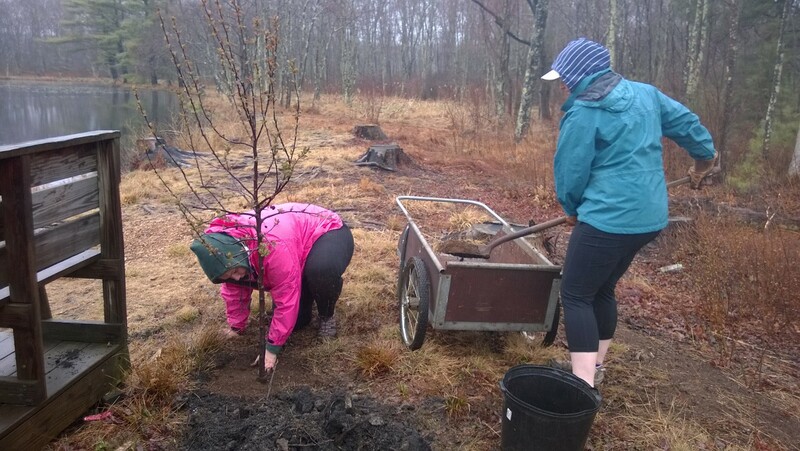 Meghan and Caite Tracy planting crab apple trees at the observation deck at Bull Pond. 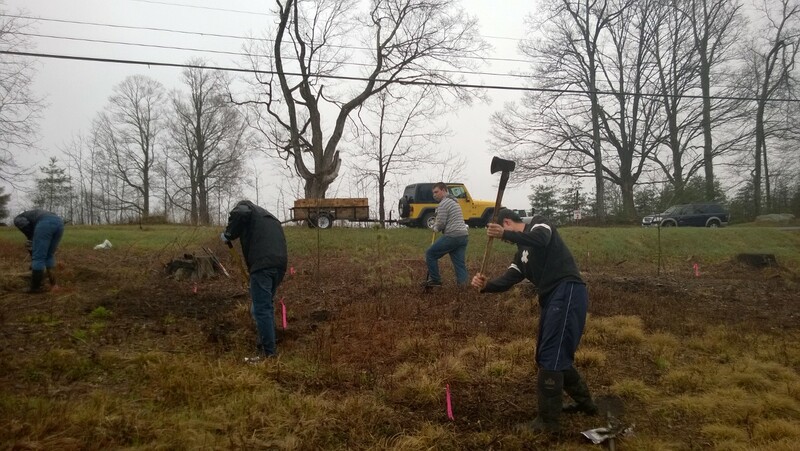 In the cleared hillside, approximately 40 hemlocks and 10 red oaks were planted for reforestation. 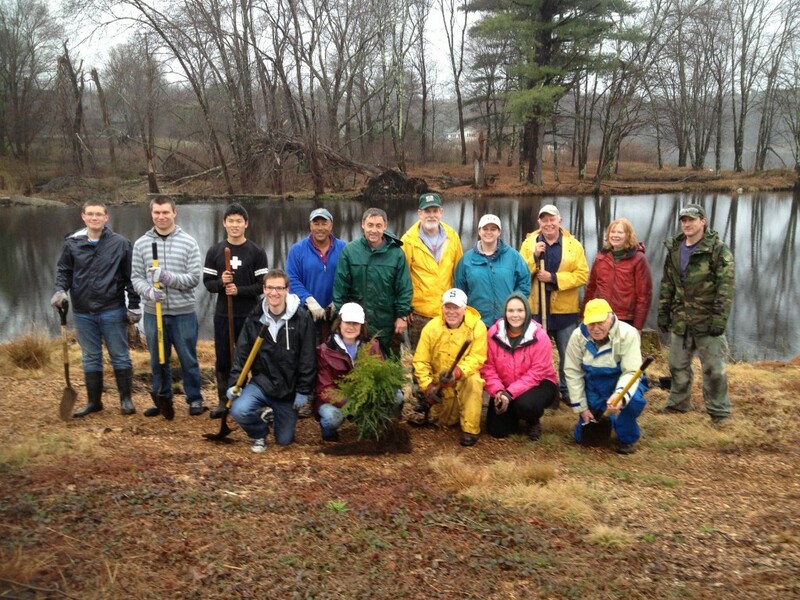 Lewis Mills High School Students dig holes and plant trees at Bull Pond. Now that the plants are in place, we’ll need to regularly brush cut around them to make sure that the briars and tall weeds don’t re-infest the area. We hope to improve the visual appearance of the entry trail as it passes between a wetland and private property. To better naturalize this section of trail, approximately 60 hemlock trees were randomly planted between the trail and the private property, as well as on a hillside overlooking that property. 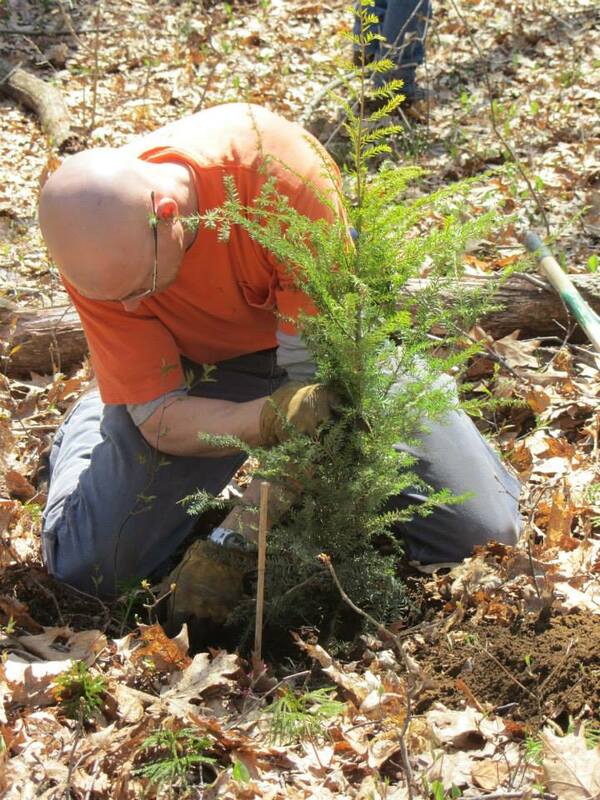 Rick Foote plants a hemlock tree at Forever Forest. Very few hemlocks are present in Forever Forest, which is dominated by hardwoods, such as oak, maple, hickory, beech, and birch. Unlike the hardwoods, the hemlocks will provide greenery and a scenic buffer through the year. 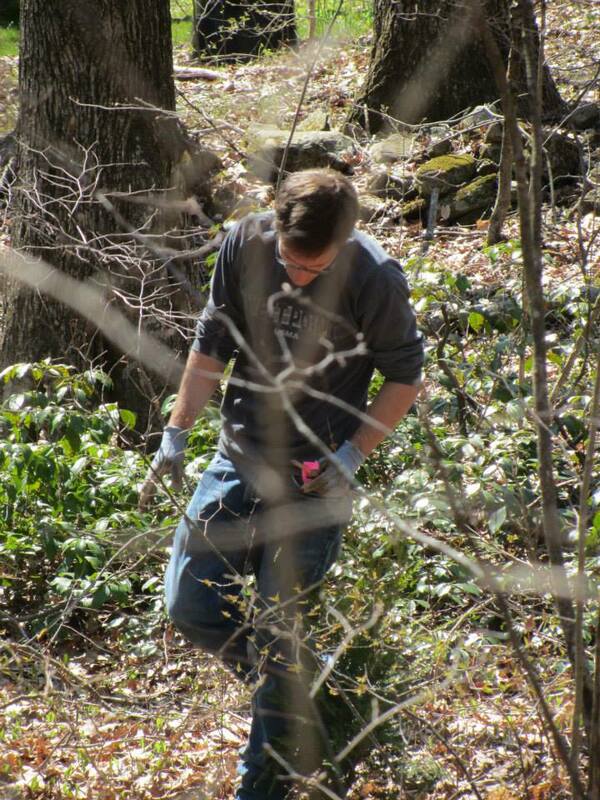 Anthony Erwin scouts out locations for tree planting. Both planting parties were very successful, and all plants were healthy and in great shape. We had very good turn-outs both mornings, especially considering the very rainy, raw day of April. The many hands made the hard work of planting trees in rocky-rooty soil go smoothly. Both mornings actually turned out to be great fun, and we all walked away with a good sense of satisfaction with a job well done. 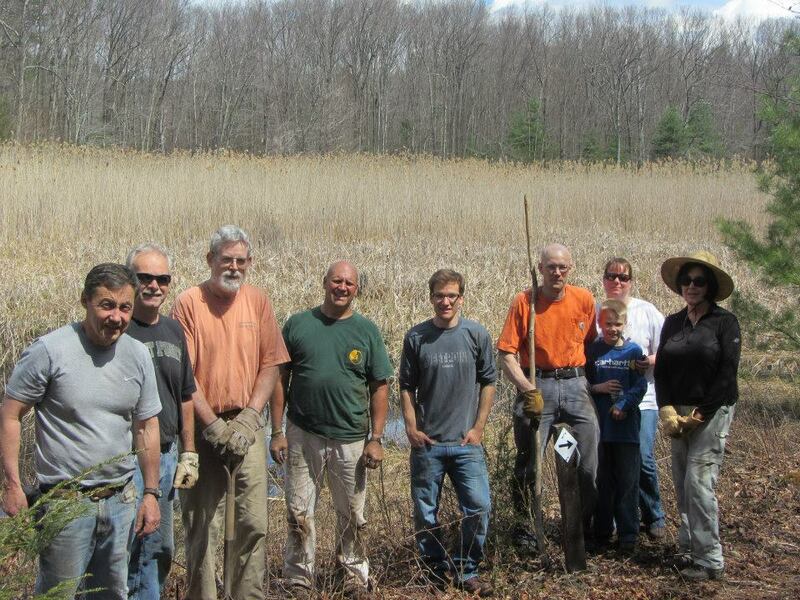 The Land Trust wants to thank everyone who took part in the plantings — the crew at Bull Pond: Bob Orciari, Liz and Martin Brayboy, Howard and Sue Rood, Herb Etter, Rob Lesniewski, Larry Connors, Bill, Meghan, and Caite Tracy, Liam Curran, Anthony Erwin, Mike Carlson, and Jesse Quinn-Alger and the crew at Forever Forest: Bob Orciari, Cheryl and Jeff Ganoe, Bill Tracy, Bill Lindquist, Elaine S., Anthony Erwin, and the Foote family–Stacy, Rick, and their young son, Ricky. A big thumbs-up goes to the energetic digging provided by Lewis Mills students, including some from the Eco-Action Club. Jeff Ganoe was most helpful in pre-work party brush cutting at Bull Pond, so that we didn’t have to fight through extensive briars to plant the trees. We are most grateful to the Community Foundation of NW CT, which fully funded the cost of plants and planting material. The Foundation’s funding was crucial in allowing our trust, with its very limited budget, to complete this important project.